The Porcher Semplice Basin will be a stunning addition to any bathroom. However, be careful if you are relying on the dimensions stated on the Porcher website. 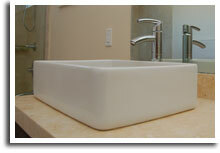 Listed as the Semplice Rectangle Basin by Porcher, the overall dimensions provided are 15-1/4″ x 15-1/4″ x 6″. So, how can a 15-1/4″ x 15-1/4″ basin be a rectangle? It cannot. The spec sheet repeats this error by listing the above dimensions. However, the drawing shows a 21-3/4″ x 15-1/4″ x 6″ basin, which conforms more to the traditional dimensions of a rectangle. So, if you are looking for a square basin, don’t be fooled by the square dimensions and end up buying the rectangular one (like I did).